GET YOUR BUSINESS NOTICED!! ATTRACT NEW CUSTOMERS. FOR AS LITTLE AS $20 PER MONTH!!! The Write Up is the leading urban news source for relevant, thought-provoking news and information on business, politics, education, entertainment, sports,gossip and more. Our audience is progressive, politically concerned, culturally aware, family-oriented urban consumers. We educate our readers and discuss viewpoints in a way that can economically, politically, and socially empower them. The Write Up has the reach and credibility to provide advertisers with a cost effective link with the valley's 1.5 Million and Las Vegas, NV., growing urban consumer market. Make that move advertise with us and get your Business seen! 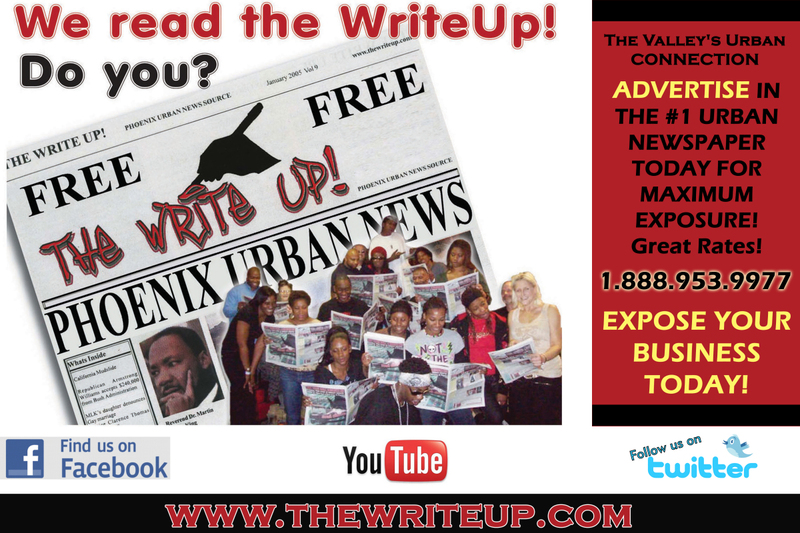 Juniques Marketing Now offers Ad Special for the Urban News Source for Arizona from juniques marketing on Vimeo. Rickey Johnson, Independent Sales Agent, for the Urban News Source Newpaper, The WriteUp. Announcing the opening of the advertising promotions specials. and the Las Vegas, Nevada urban market. The Urban is a vibrant market and growing. urban happenings and businesses that want their business. Make sure you get your copy!!! Business owners contact me now in get our next issue!!! Ask about about our ad specials and additional promotional services. ways to reach consumers that are ready to buy. The Internet is a great place to share your message. Keep in Mind, Everyone is not on the internet. computers, etc. People like to read the paper. internet service providers. The paper just requires readers!! The paper is one of the time tested proven ways people find out about your community news, business services and locations, and where the savings are for getting goods and services!!! Make sure the newspaper is included in your promotions. Urban areas may be cities, towns, and/or a large city surrounded closely by smaller ones. An urban area may be defined by the number of residents, the population density, the percent of people not dependent upon agriculture. Statistical inaccuracy of the euphemism"Urban" as a euphemism for black is today statistically inaccurate as blacks have moved en masse from inner cities to suburbs, and as the central areas of cities have seen large influxes of Hispanic, white and in some cases Asian American populations. People who have shared attitudes, values, goals, and practices that characterizes and institution, organization, or group. The people who need product and services that meet their needs. Unlike an urban area, a metropolitan area includes not only the urban area, but also satellite cities plus intervening rural land that is socio-economically connected to the urban core city, typically by employment ties through commuting, with the urban core city being the primary labor market. In fact, urbanized areas grow, as the core population/economic activity center, within a larger metropolitan area. in Metro Phoenix and surrounding cities Also Reaching the Las Vegas NV market!!! Ask about our full color business cards, full color post card flyers, and full color car magnets. Yes keep me updated to The Write Up, Urban Newspaper Happenings! !